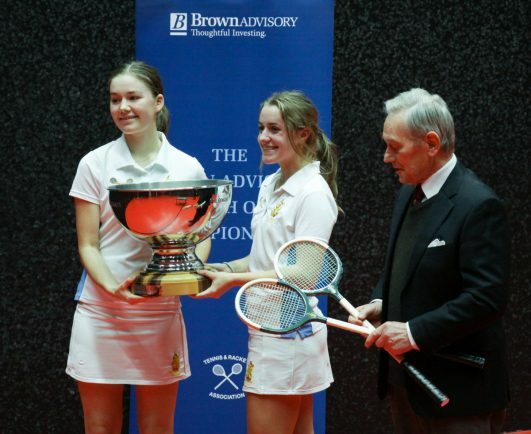 Lauren Gooding and Issie Thorneycroft receiving their trophy from former rackets champion Howard Angus. JUNIOR golf international Lauren Gooding and hockey star Issie Thorneycroft became the youngest-ever winners of the British Women’s Rackets Doubles Championships held at Malvern College. 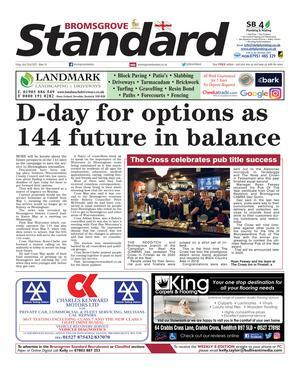 The event attracted a record entry, including seven pairs from Cheltenham College as well as competitors from Wellington and Clifton College. Wellington College students Gooding, 17, and Thorneycroft, 16, powered through both of their opening matches thanks to their extra experience and weight of shot, though Cliftonians Flora McHattie and Katya Saint produced some spirited exchanges. The Old Cheltonians pair of India Blake and Georgie Gunn retrieved well against them in the semi-finals but failed to cope with Gooding’s tight serving on the crucial points. The second seeds India Deakin and Abbie Whybrow survived a closer semi-final battle against last year’s plate winner Fionnuala Dowling-Membrado and her new partner Molly Clarke but just edged them out in two high-quality games. In the final Gooding and Thorneycroft went for their shots from the opening rallies and took the first game with some accomplished volleys. Deakin and Whybrow fought back strongly to level at a game apiece, thanks to Deakin’s strategic use of the angles but once Gooding found her length on her serve, the second seeds were always on the back foot. Thorneycroft produced some explosive hitting in the fourth game and was well backed up by the elegant Gooding as they closed out the match in style 15-11, 15-9. This was the first time a schoolgirl pair had taken the prestigious championship.